This post was inspired by my hubby! It's been a lazy Sunday. Well, not totally lazy, but we didn't leave the house. Hubby has been smoking beef brisket all night and day, doing yard work, and watching a bit of football. I've been crafting, helping the girls create a no carve pumpkin for school, and "researching" on Pinterest. It was a nice relaxing day after a busy one yesterday. After the craft fair, we headed over to Daytona Beach to see my husband's parents. They were staying in a condo on the beach for a long weekend getaway. We were just going to hang out and have dinner with them, so we grilled out steaks and watched the ocean from their condo. They stayed in the presidential suite! The room was beautiful and perfect for hanging out with the family. The balcony was huge and windows took up the whole side facing the ocean. Ava had a great time trying out all the soaps, shampoos and conditioners while Emma watched TV. Lia, of course, tried to climb up and down the tile stairs. Always into trouble! So, as I was saying, it was nice to have a relaxing day at home just doing stuff around the house. We were watching the disappointing Miami Dolphins game (husband's team), when he brought me a drink. I knew it had to be an alcoholic drink since we really didn't have anything much but water in the house. Plus he must have been in the mood for something alcoholic after that game! ;-) He likes to experiment with the drinks and mixes we have accumulated in our pantry. I'd have to say this one was a success! by Love Bug Living & Hubby! This tastes just like sweet tea with a squeeze of lime! 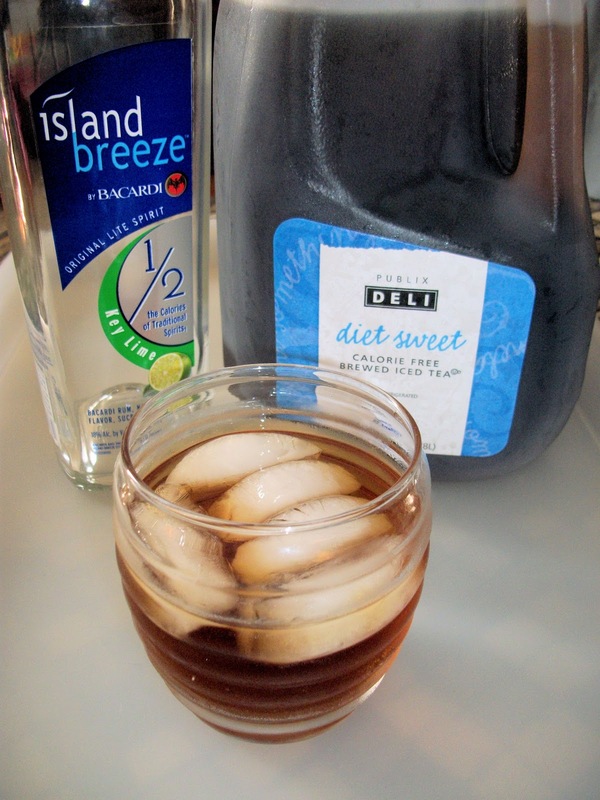 Plus mine was low cal since we used diet sweet tea and the Island Bteeze has 1/2 the calories of regular alcohol! Yummy and refreshing!